DUBAI (Reuters) - Iranian President Hassan Rouhani proposed on Sunday a state budget of about $100 billion for next year, loosening the purse strings to support economic growth as Donald Trump's election threatens to put renewed pressure on Tehran. The U.S. president-elect said during his campaign that he would scrap last year's nuclear agreement between Iran and world powers, in what would be a big blow to the Iranian economy just as it emerges from years of sanctions. Rouhani announced a draft budget for the Iranian year that will start on March 21 of 3,200 trillion rials ($99.7 billion at the official exchange rate), excluding state enterprises. That is up 9 percent from the plan for the current year. 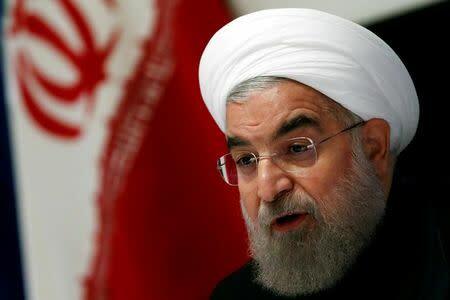 "Maintaining the growth rate that was launched in the (current) year is the main economic issue for the country and all economic policies should be designed around this axis," Rouhani told parliament in a speech carried live by state television. After struggling for years under sanctions, Iran's economy has picked up after most restrictions were removed in January under a deal with world powers on Tehran's nuclear program. The International Monetary Fund estimates growth of 4.5 percent this year, up from just 0.4 percent last year. But Rouhani is under pressure to sustain economic growth as his hardline opponents, who were against the nuclear agreement, say he has failed to improve living standards as much as hoped after the lifting of sanctions. The next presidential elections are due in mid-2017. Trump's pledge to scrap the nuclear deal may mean his administration will reimpose sanctions or at least interpret remaining ones more stringently. Even if Trump takes no concrete action, uncertainty over Washington's intentions in the next few years could make companies around the world more cautious about trading with or investing in Iran, limiting the economic boost which Rouhani hoped to gain from the nuclear deal. So the draft budget partially loosens the conservative fiscal policy which Rouhani adopted after taking power in 2013. Taking into account inflation running at about 9 percent, next year's draft budget envisages roughly zero spending growth in real terms. The current year's budget, compiled when inflation was considerably higher, represents a rise of slightly over 7 percent from the previous year's plan. "We hope to end the (current) year with single-digit inflation, a 5 percent growth rate and the creation of 700,000 new jobs," Rouhani said in his speech. As in past years, the draft budget shows spending and revenues in balance, although the actual result will depend on fluctuations in oil prices. Next year's budget assumes oil prices of $45-$55 per barrel, Iranian news agencies reported, up from $40 for the current year's budget.